These activities have been developed by national reading experts for you to use with children, ages birth to Grade 6. The activities are meant to be used in addition to reading with children every day. In using these activities, your main goal will be to develop great enthusiasm in the reader for reading and writing. You are the child's cheerleader. It is less important for the reader to get every word exactly right. It is more important for the child to learn to love reading itself. If the reader finishes one book and asks for another, you know you are succeeding! If your reader writes even once a week and comes back for more, you know you have accomplished your beginning goals. We wish you many wonderful hours of reading and writing with children! Babies love to listen to the human voice. What better way than through reading! Some books written especially for babies (books made of cardboard or cloth with flaps to lift and holes to peek through). Start out by singing lullabies and folk songs to your baby. When your baby is about six months old, choose books with brightly colored, simple pictures and lots of rhythm in the text. (Mother Goose rhymes are perfect.) Hold your baby in your lap so he/she can see the colorful pages of the book. Include books that show pictures and names of familiar objects. Vary the tone of your voice with different characters in the stories, sing nursery rhymes, make funny faces, do whatever special effects you can to stimulate your baby's interest. Allow your child to touch and hold cloth and sturdy cardboard books. When reading to a baby, keep the sessions brief but read daily and often. As you read to your baby, your child is forming an association between books and what is most loved – your voice and closeness. Allowing babies to handle books deepens their attachment even more. What's "old hat" to you can be new and exciting to toddlers and preschoolers. When you talk about everyday experiences, you help children connect their world to language and enable them to go beyond that world to new ideas. As you get dinner ready, talk to your child about things that are happening. When your 2- or 3-year-old "helps" by taking out all the pots and pans, talk about them. "Which one is the biggest?" "Can you find a lid for that one?" "What color is this one?" When walking down the street and your toddler or preschooler stops to collect leaves, stop and ask questions that require more than a "yes" or "no" answer. "Which leaves are the same?" "Which leaves are different?" "What else grows on trees?" Ask "what if" questions. "What would happen if we didn't shovel the snow?" "What if that butterfly lands on your nose?" Answer your child's endless "why" questions patiently. When you say, "I don't know, let's look it up," you show how important books are as resources for answering questions. After your child tells you a story, ask questions so you can understand better. That way children learn how to tell complete stories and know you are interested in what they have to say. Expose your child to varied experiences – trips to the library, museum, or zoo; walks in the park; or visits with friends and relatives. Surround these events with lots of comments, questions, and answers. Talking enables children to expand their vocabulary and understanding of the world. The ability to carry on a conversation is important for reading development. Remember, it is better to talk too much rather than too little with a small child. Repetition makes books predictable, and young readers love knowing what comes next. Books with repeated phrases (Favorites are: Alexander and the Terrible, Horrible, No Good, Very Bad Day by Judith Viorst; Brown Bear, Brown Bear, What Do You See? by Bill Martin, Jr.; Horton Hatches the Egg by Dr. Seuss; and The Little Engine That Could by Watty Piper. (Wolf voice:) "Little pig, little pig, let me come in." (Little pig:) "Not by the hair on my chinny-chin-chin." (Wolf voice:) "Then I'll huff and I'll puff and I'll blow your house in!" After the wolf has blown down the first pig's house, your child will soon join in with the refrain. Read slowly, and with a smile or a nod, let your child know you appreciate his or her participation. As the child grows more familiar with the story, pause and give him or her a chance to fill in the blanks and phrases. Encourage your child to pretend to read, especially books that contain repetition and rhyme. Most children who enjoy reading will eventually memorize all or parts of a book and imitate your reading. This is a normal part of reading development. When children anticipate what's coming next in a story or poem, they have a sense of mastery over books. When children feel power, they have the courage to try. Pretending to read is an important step in the process of learning to read. When children "act out" a good poem, they learn to love its rhyme, rhythm, and the pictures it paints with a few well-chosen words. They grow as readers by connecting feelings with the written word. Poems that rhyme, tell a story, and/or are written from a child's point of view. If there is a poem your child is particularly fond of, suggest acting out a favorite line. Be sure to award such efforts with delighted enthusiasm. Suggest acting out a verse, a stanza, or the entire poem. Ask your child to make a face the way the character in the poem is feeling. Remember that facial expressions bring emotion into the performer's voice. Be an enthusiastic audience for your child. Applause is always nice. If your child is comfortable with the idea, look for a larger setting with an attentive, appreciative audience. Perhaps an after-dinner "recital" for family members would appeal to your child. Mistakes are a fact of life, so ignore them. Poems are often short with lots of white space on the page. This makes them manageable for new readers and helps to build their confidence. Talking about what you read is another way to help children develop language and thinking skills. You won't need to plan the talk, discuss every story, or expect an answer. Read slowly and pause occasionally to think aloud about a story. You can say: "I wonder what's going to happen next!" Or ask a question: "Do you know what a palace is?" Or point out: "Look where the little mouse is now." Answer your children's questions, and if you think they don't understand something, stop and ask them. Don't worry if you break into the flow of a story to make something clear. But keep the story flowing as smooth as possible. Talking about stories they read helps children develop their vocabularies, link stories to everyday life, and use what they know about the world to make sense out of stories. Children are great mimics. When you tell stories, your child will begin to tell stories, too. Have your child tell stories like those you have told. Ask: "And then what happened?" to urge the story along. Listen closely when your child speaks. Be enthusiastic and responsive. Give your child full attention. If you don't understand some part of the story, take the time to get your child to explain. This will help your child understand the relationship between a speaker and a listener and an author and a reader. Encourage your child to express himself or herself. This will help your child develop a richer vocabulary. It can also help with pronouncing words clearly. Having a good audience is very helpful for a child to improve language skills, as well as confidence in speaking. Parents can be the best audience a child will ever have. Television can be a great tool for education. The keys to successful TV viewing are setting limits, making good choices, taking time to watch together, discussing what you view, and encouraging follow-up reading. Limit your child's TV viewing and make your rules and reasons clear. Involve your child in choosing which programs to watch. Read the TV schedule together to choose. Monitor what your child is watching, and whenever possible, watch the programs with your child. When you watch programs with your child, discuss what you have seen so your child can better understand the programs. Many experts recommend that children watch no more than 10 hours of TV each week. Limiting TV viewing frees up time for reading and writing activities. It is worth noting that captioned TV shows can be especially helpful for children who are deaf or hard-of-hearing, studying English as a second language, or having difficulty learning to read. Here are a few ways to create a home rich in words. Hang posters of the alphabet on the bedroom walls or make an alphabet poster with your child. Print the letters in large type. Capital letters are usually easier for young children to learn first. Label the things in your child's pictures. If your child draws a picture of a house, label it with "This is a house." and put it on the refrigerator. Have your child watch you write when you make a shopping list or a "what to do" list. Say the words aloud and carefully print each letter. Let your child make lists, too. Help your child form the letters and spell the words. Look at newspapers and magazines with your child. Find an interesting picture and show it to your child as you read the caption aloud. Create a scrapbook. Cut out pictures of people and places and label them. By exposing your child to words and letters often, your child will begin to recognize the shapes of letters. The world of words will become friendly. Writing helps a child become a better reader, and reading helps a child become a better writer. Ask your child to dictate a story to you. It could include descriptions of your outings and activities, along with mementos such as fall leaves and flowers, birthday cards, and photographs. Older children can do these activities on their own. Use a chalkboard or a family message board as an exciting way to involve children in writing with a purpose. Keep supplies of paper, pencils, markers, and the like within easy reach. Encourage beginning and developing writers to keep journals and write stories. Ask questions that will help children organize the stories, and respond to their questions about letters and spelling. Suggest they share the activity with a smaller brother, sister, or friend. Respond to the content of children's writing, and don't be overly concerned with misspellings. Over time you can help your child concentrate on learning to spell correctly. When children begin to write, they run the risk of criticism, and it takes courage to continue. Our job as parents is to help children find the courage. We can do it by expressing our appreciation of their efforts. The main thing is to find books you both love. They will shape your child's first impression of the world of reading. Ask friends, neighbors, and teachers to share the titles of their favorite books. Visit your local public library, and as early as possible, get your child a library card. Ask the librarian for help in selecting books. Have your child join you in browsing for books and making selections. Look for award-winning books. Each year the American Library Association selects children's books for the Caldecott Medal for illustrations and the Newbery Medal for writing. Check the book review section of the newspapers and magazines for the recommended new children's books. If you and your child don't enjoy reading a particular book, put it aside and pick up another one. Keep in mind that your child's reading level and listening level are different. When you read easy books, beginning readers will soon be reading along with you. When you read more advanced books, you instill a love of stories, and you build the motivation that transforms children into lifelong readers. It's important to read to your child, but equally important to listen to them read to you. Children thrive on having someone appreciate their developing skills. Listen carefully as your child reads. Take turns. You read a paragraph and have your child read the next one or you read half the page and your child reads the other half. As your child becomes more at ease with reading aloud, take turns reading a full page. Keep in mind that your child may be focusing more on how to read the words than what they mean, and your reading helps to keep the story alive. Ask the child to skip over the word, read the rest of the sentence, and then say what would make sense in the story for the missing word. Guide the child to use what he or she knows about letter sounds. Tell your child how proud you are of his or her efforts and skills. Listening to your child read aloud provides opportunities for you to express appreciation of his or her new skills and for them to practice their reading. Most importantly, this is another way to enjoy reading together. Family stories enrich the relationship between parent and child. Time set aside for talking with your child. Tell your child stories about your parents and grandparents. You might even put these stories in a book and add old family photographs. Have your child tell you stories about what happened on special days, such as holidays, birthdays, and family vacations. Reminisce about when you were little. Describe things that happened at school involving teachers and subjects you were studying. Talk about your brothers, sisters, or friends. Write a trip journal with your child to create a new family story. Recording the day's events and pasting the photographs into the journal ties the family story to a written record. You can include everyday trips like going to the market or the park. It helps for children to know that stories come from real people and are about real events. When children listen to stories, they hear the voice of the storyteller. This helps them hear the words when they learn to read aloud or read silently. Something important happens when children receive and write letters. They realize that the printed word has a purpose. Send your child little notes (by putting them in a pocket or lunch box, for example). When your child shows you the note, read it aloud with expression. Some children will read the notes on their own. When your child expresses a feeling or a thought that relates to a person, have your child write a letter. Have your child dictate the words to you if your child doesn't write yet. I like it when you make ice cream. It's better than the kind we buy at the store. Ask the people who receive these notes to respond. An oral response if fine – a written response is even better. Explain the writing process to your child: "We think of ideas and put them into words; we put the words on paper; people read the words; and people respond." Language is speaking listening, reading, and writing. Each element supports and enriches the others. Sending letters will help children become better writers, and writing will make them better readers. Stories for young children should be of all kinds – folktales, funny tales, exciting tales, tales of the wondrous and stories that tell of everyday things. An essential step in learning to read is good books read aloud. Parents who read aloud to their children are teaching literacy concepts simply by sharing books. Encourage your children to listen, ponder, make comments, and ask questions. Be flexible enough to quickly abandon a book that does not appeal after a reasonable try at reading it. No one is meant to enjoy every book. And no one, especially a child, should be forced to read or listen to books that bore. Even after children have outgrown picture books they still enjoy hearing a story read aloud. Hearing a good story read well, especially if it is just a little beyond a child's own capabilities, is an excellent way to encourage independent reading. Not all books are best read aloud; some are better enjoyed silently. There are plenty of children's books that are twice as satisfying when they are shared a chapter at a time before bed or during long car rides. There are some books that children should not miss, books that they will want to hear many times and ultimately read for themselves. Young children want to read what makes them laugh or cry, shiver and gasp. They must have stories and poems that reflect what they themselves have felt. They need the thrill of imagining, of being for a time in some character's shoes for a spine-tingling adventure. They want to experience the delight and amazement that comes with hearing playful language. For children, reading must be equated with enjoying, imagining, wondering, and reacting with feeling. If not, we should not be surprised if they refuse to read. So let your child sometime choose the story or book that they want you to read to them. Give your child many opportunities to read and write stories, lists, messages, letters, notes, and postcards to relatives and friends. Since the skills for reading and writing reinforce one another, your child's skills and proficiency in reading and writing will be strengthened if you help your child connect reading to writing and writing to reading. Children love to be creative when it comes to drawing, and illustrations add visual imagery to stories. Find a fable, fairy tale, or other short story for your child to read. 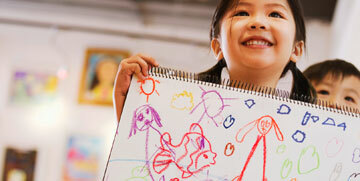 Then ask your child to illustrate a part of the story he or she likes best or describe a favorite character. Have the child dictate or write a few sentences that tell about this picture. Use your weekly shopping trip as an opportunity to help your child develop reading and writing skills. As you make out your grocery shopping list, give your child a sheet of paper and read the items to him or her. If the child asks for spelling help, write the words correctly for him or her to copy or spell the words aloud as your child writes them. Ask your child to look through the newspaper ads to find the prices of as many items as possible. Your child can write these prices on the list and then look through your coupons to select the ones you can use. Take your child to the supermarket and ask him or her to read each item to you as you shop. Cooking is always a delight for children, especially when they can eat the results! Show your child a recipe and go over it together. Ask your child to read the recipe to you as you work, and tell the child that each step must be done in a special order. Let your child help mix the ingredients. Allow your child to write down other recipes from the cookbook that he or she would like to help make. A dictionary is a valuable learning tool, especially if your child makes up his or her own booklet of words that are challenging. Encourage your child to make a dictionary by putting together several sheets of paper for a booklet. Ask your child to write at the top of each page a new word he or she has recently learned. If the word can be shown in a picture, have him or her look through magazines and newspapers to find pictures that illustrate the words and paste them on the correct pages. Have your child write the meaning of each word and a sentence using each new word. Your child can then use some or all of these sentences as the basis for a creative story. Have your child read this story to you and other family members. Keeping a journal is a way for your child to write down daily events and record his or her thoughts. Two notebooks - one for your child and one for you! Help your child start a journal. Say what it is and discuss topics that can be written about, such as making a new friend, an interesting school or home activity just completed, or how your child felt on the first day of school. Encourage your child to come up with other ideas. Keep a journal yourself and compare notes at the end of the week. You and your child each can read aloud parts of your journals that you want to share. Everyone loves to get mail, especially when the card has been personally designed. Ask your child to list the birthdays of family members, relatives, and friends. Show your child some store-bought birthday cards with funny, serious, or thought-provoking messages. Your child can then create his or her own birthday card by using a folded piece of paper, making an attractive cover, and writing a short verse inside. Then your child can mail the cards to friends and relatives for their birthdays. Reading a book is more fun when you have a homemade bookmark to mark your spot. Provide your child with a piece of cardboard about 6" long and 2" wide. On one side of the bookmark, have your child draw a picture of a scene from a book he or she has read. On the other side, ask your child to write the name of the book, its author, publisher, publication date, and a few sentences about the book. After making several of these bookmarks, you might ask the child to send them to friends and relatives as gifts accompanied by a short note. The telephone book contains a wealth of information and is a good tool for reading and writing. Have your child look through the yellow pages of the telephone directory, select a particular service, and write a clever or funny ad for it. Have your child read this ad to you. Help your child to find your own or a friend's listing in the white pages of the telephone book. Explain the different entries (for example, last name and address), along with the abbreviations commonly used. Children love to read road maps and this activity actually helps them with geography. When planning a vacation, let your child see the road map and help you plan where you will drive. Talk about where you will start and where you will end up. Let your child follow the route between these two points. Encourage your child to write to the Chamber of Commerce for brochures about places you will see on your trip. Activity 24: What's in the news? Newspapers are a form of daily communication with the outside world, and provide lots of learning activities for children. Clip out an interesting news story and cut the paragraphs apart. Ask your child to read the paragraphs and put them in order. Ask your child to read a short editorial printed in your local newspaper and to underline all the facts with a green pencil and all the opinions with an orange pencil. Pictures fascinate children of all ages. Clip pictures in the newspaper. Ask your child to tell you about the picture or list adjectives to describe the picture. Do you take your child to the movies? Have your child first look up the movie page by using the index in the newspaper. After a movie has been chosen, have your child study the picture or text in the ad and tell you what he or she thinks the movie is about. Have your child pick a headline and turn it into a question. Then the child can read the article to see if the question is answered. Ask your child to clip food coupons from the newspaper for your grocery shopping trips. First, talk about which products you use and which you do not. Then the child can cut out the right coupons and putt hem into categories such as drinks and breakfast items. You can then cash in the coupons at the store. Pick out an interesting article from the newspaper. As you are preparing lunch or dinner, tell your child that you are busy and ask him or her to read the article to you. Many newspapers publish materials especially written for children, such as the syndicated "Mini Page," "Pennywhistle Press," and "Dynamite Kids." In addition, some newspapers publish weekly columns for children, as well as tabloids and summer supplements written by educators. What child doesn't enjoy watching TV? Capitalize on this form of entertainment and use TV to help rather than hinder your child's learning. Some important ideas to consider before turning on the TV: Limit in some way the amount of TV your child watches so as to leave time for reading and other activities. Decide how much time should be set aside for watching TV each day. Serve as an example by limiting the amount of TV you yourself watch. Have time when the TV set is off and the entire family reads something. You may want to watch TV only for special shows. Before the TV set is turned on, encourage your child to select the programs he or she wishes to watch. Ask your child to give you the reason for the choices made. In addition, watch some of the same TV programs your child watches. This helps you as a parent share in some of your child's daily activities. Ask your child to tell you about favorite TV characters using different kinds of words. As your child watches commercials on television, ask him or her to invent a product and write slogans or an ad for it. Encourage your child to watch such programs as Reading Rainbow. Urge older children to watch such programs as 60 Minutes and selected documentaries. These programs are informative. Discuss interesting ideas covered in the programs and direct your child to maps, encyclopedias, fiction, or popular children's magazines for more information. Have your child name 10 of his or her favorite shows. Ask your child to put them into categories according to the type of show they are, such as family shows, cartoons, situation comedies, sports, science fiction, or news and information. If you find the selection is not varied enough, you might suggest a few others that would broaden experiences. Prepare a monthly calendar with symbols such as a picture of the sun to represent an outdoor activity or a picture of a book to represent reading. Each time your child engages in a daily free time activity, encourage him or her to paste a symbol on the correct calendar date. This will give you an idea of how your child spends his or her free time. It also encourages a varied schedule. Ask each child in your family to pick a different color. Using the TV listing, have each child use this color to circle one TV program that he or she wants to watch each day. Alternate who gets first choice. This serves two purposes. It limits the amount of time watching TV and it encourages discriminating viewing. Devise a rating scale from 1 to 5. Ask your child to give a number to a certain TV program and to explain why such a rating was given. Have your child keep a weekly TV log and write down five unfamiliar words heard or seen each week. Encourage your child to look up the meanings of these words in the dictionary or talk about them with you. Kameenui, E. J., & Simmons, D. C. (May, 1997). Read*Write*Now! Activities for Reading and Writing Fun. A Joint Project of the U.S. Department of Education, the American Library Association, Pizza Hut, Inc., Scholastic, Inc., Reading Is Fundamental, Inc.
thanks a lot this really helped me. these activities are very useful to parents because, very few parents believe that children learn through play. I love this web site it is so great for you children. It will teach your them and they will be reading in no time. It`s really important the information to improve the reading and writing of our children. these activities are good and useful to me. can you help me with science reading activities? Very helpful and informative .... helpful in understanding child psychology and their requirements. these are good activities. in fact, i got some ideas here for my teaching demo. thanks a lot. i highly appreciate it. this is really useful for us as parents and teachers.Thanks a lot. Even though these ideas were released in 1997, they are more timely than ever. We must spend some time reading with our children. Do we really want to set the example that landing in front of a t.v. is more important than they are? This is of great help to teachers and pupils. Thank you for sharing.